During Open Engagement (OE) 2016 at the Oakland Museum of California (OMCA), this year’s theme of power affirmed the potential of asking “Who speaks?” and presented troubling realities and questions. In aligning art and social engagement, OE is a platform for presenters and attendees to consider the privilege, intentions, and power dynamics of who speaks in the conference and society at large. OE is a unique opportunity for all involved to define our objectives and test the consistency with which we adhere or diverge from them. In attempting to balance inclusivity with quality and cohesion, OE becomes a microcosm for questioning and working through the uncomfortable and unanswerable issues of social engagement in relation to art. With equity on the minds of many attendees, participants at all levels must ask who has the power and privilege to be involved in these discussions. In considering who has the power to speak, OE’s network of collaborators is central to it’s ability to be inclusive. Before the conference, OE issued a free call for proposals via their internal email list, an e-flux Art & Education ad, and their national consortium—composed of A Blade of Grass, California College of the Arts, Oakland Museum of California, Queens Museum, and University of Illinois at Chicago School of Art & Art History. While the consortium is decidedly from the professional art world of higher education and museums (with the exception of a Blade of Grass, which even as an independent organization is a well-funded nonprofit with a board, staff and advisors–most of which are themselves art world professionals), OE also partnered with eighty Bay Area-based organizations dedicated to art, social justice, government, youth programs, and scholarly research.1 While OE has publicly announced the members of its national consortium, they have not identified their local network by name. While listing all of their affiliates may be cumbersome, publicizing their names would treat them as equal to their national consortium. Additionally, acknowledging OE’s local partners could create visibility and additional opportunities for other artists, institutions, and attendees to collaborate beyond the conference and throughout its growing network of host cities.2 Without knowing exactly who OE’s local affiliates were in spreading the word about the conference and call for proposals, it is difficult to ascertain if they have been diligent in inviting a wide spectrum of individuals to be involved in the conversation. Understanding OE’s selection process is equally important in identifying their terms for inclusion and equity. OE’s 2016 selection committee was composed of representatives from their staff, national consortium, students, and community participants. OE has been transparent in identifying their volunteer selection committee by name.3 In selecting the presenters, the committee graded the applicants with a numerical value from one to five in three areas: “relevance” to the submission category and the broader field of social practice; what the “audience value” is in serving the conference attendees in subject and number; and how the proposal will “impact” the conference and in the wider and longer terms for the participants and their home communities.4 As organizers balance the quality of experience and the cohesiveness of the event, they engage in judgement. While “quality” and “evaluation” may impose the rarified languages and standards of elite art education and institutions, completely avoiding these terms would most likely result in ineffective and unfocused conferences, which are now thematically based.5 OE does have a limited capacity and with over ninety panels on Saturday and Sunday, not including the open house events on Thursday and Friday, the conference pushed the limits of the audience’s attention. While OE can intentionally shape the diversity of its presenters and panels, it is more difficult to diversify its attendees. While I don’t have statistics to indicate the racial backgrounds of the audience8, casual conversation with other attendees and some panels seem to resoundingly conclude that the conference is a “white space” in terms of its audience. When the curatorial statement for the conference cites the Black Panther Party, the Arab Spring, and #BlackLivesMatter and their relations to power, communication, and liberation, the racial and socio-economic homogeneity of many attendees is problematic. Unfortunately, this lack of racial diversity has been played out at other conferences, as with Hand-in-Glove 2015, which I didn’t attend, but has been recounted by Anthony Romero. Without racial and economic diversity amongst its conference attendees, OE potentially becomes a group of elites, primarily white, lamenting the injustices of our society without giving those directly affected by inequality a voice. With its very subject, art and social engagement, OE has a limited, but very dedicated pool of people who might be interested in attending the conference. As I have earlier argued, without knowing who OE partnered with locally, I am uncertain if they did enough outreach to increase the diversity of attendees by partnering with organizations outside the academic and museum context, like groups dedicated to s dedicated to racial/ethnic identification or labor or union organizers. In contrast to tactics that would invite people to OE, the newly instated attendance fee is a barrier for diversifying the audience, it is also an issue for those who are already interested in the conference but financially insecure.9 With $55 for a “conference” pass and $80 for a “power” pass that included the keynote talks, OE creates a tiered pricing structure mirrors the capitalist system; money gets you a seat at the table and even more money gets you greater access. Surprisingly, OE did not offer any student discounts or a pay what you can option. Dignidad Rebelde. Quinceañera, 2009; 19” x 25”. Courtesy of the Artist. While there are challenges for OE in diversifying its audience and academic leanings, the “Local Power: Activist Groups in the Bay Area” panel powerfully mixed racial and ethnic diversity with art and activism with presentations by Johnella LaRose from Indian People Organizing for Change, Jesus Barraza from Dignidad Rebelde, and Cat Brooks, co-founder of the Anti Police-Terror Project. With Barraza as the sole speaker from the institutional art world10, the speakers delivered informative and impassioned talks that addressed land rights of the Ohlone people, Xicanisma and Zapatismo history and culture, and Black Lives Matters and police terrorism. The presenters spoke from their own personal experiences and activities and with deliveries that were fitting to each. 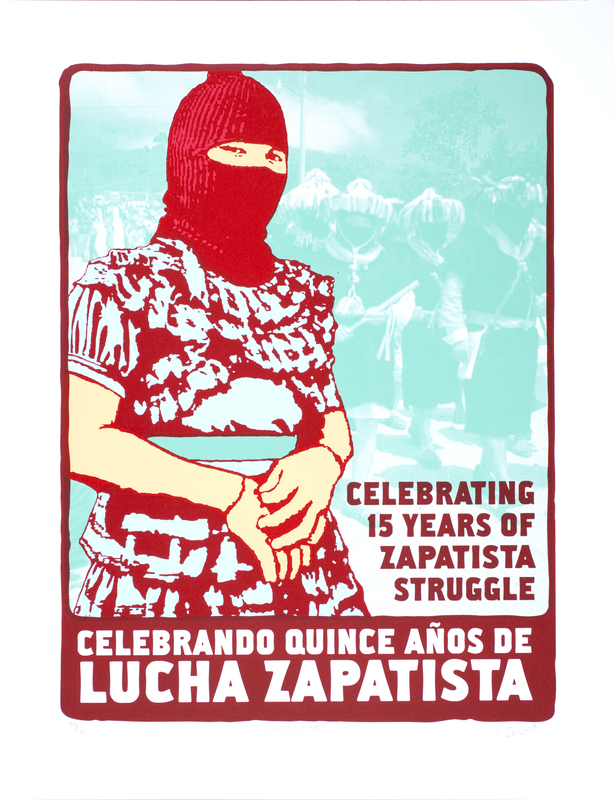 While LaRose showed images of Sogorea Te shellmounds and their attempt to create a cultural easement in a new park development, Barraza presented image of his groups silkscreened political posters and activities, and Brooks’s talk blended spoken-word elegance with a rallying call for political activism. In contrast, one of the more troubling and controversial panels as “White Privilege in Social Practice: White and POC Artists Share,” facilitated by Maggie Lawson and Phoenix Soleil.11 Lawson, a self-identified white woman, misguidedly began the panel by congratulating the white audience members for attending the panel, explaining that this is a difficult topic. In doing so, Lawson ignored all of the persons of color in the room and the difficulty that the panel might pose for us. After the facilitators introduced the panel, the three poc panelists left the stage for the three white panelists to discuss their understanding of their privilege. The poc panelists were then invited back on stage to respond. The very structure of the panel displayed the power and privilege of the white speakers where their voices were prioritized, leaving little opportunity for the poc panelists to respond. Rather than being a dialogue, this awkward structure felt like a talk therapy session where the white panelists in vocalizing their privilege absolved themselves of responsibility, an act itself of privilege. The white panelists also seemed to address “whiteness” in absolute terms, never acknowledging the spectrum of diversity and the construction of race itself. This binary division was reinforced by its structure that formally divided the conversation between white and other. OE offers the opportunity for us all to exercise self-criticality. As I write this I reflect upon my own voice and power as a writer and artist from the formal art system. In last year’s response to OE on Temporary Art Review, James McAnally and members of the FIELD Editorial Collective posited that applying the traditional art critical language to social practice is possibly ill-conceived; writing about social practice may require a new form that reimagines evaluation, voice, and description. I still don’t know yet if social practice requires a new form of writing, but can only say that the tensions between inclusivity and judgement are endemic to the field and OE. With its high ideals, very few conferences are held to such a high degree of scrutiny and commendably OE has just issued a survey to attendees. With so many hearts invested in OE, social practice, and social justice, there are always going to be debates and disappointments. While OE’s tensions may appear as problematic, it invites these discussions, which is the first step in attempting to realize change. *Correction: An earlier version this article that misstated that 5% the presenters self-identified as being Afro-Caribbean, African American, East Asian, Hawaiian, Pacific Islander, Latino, Hispanic, Middle Eastern, Arab, Native American, Alaskan Native, or First Nation.. The updated footnote indicates the correct number as 55%. Genevieve Quick is a San Francisco-based artist and art writer. Quick has been awarded residence at the de Young Museum, MacDowell, Derjassi, and Yaddo.